Within the UN system it is also recognized that this applies to the different Programmes, Conventions and Agreements set up over the years. That each of these bodies has a distinct niche and a clear role does not justify a bunker mentality. By synergizing, cooperating and collaborating they can find common cause with natural allies and seek compromises with those whose agendas do not necessarily match their own. 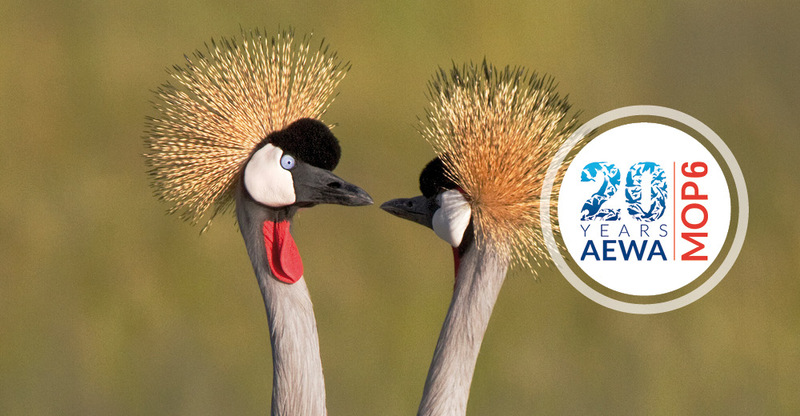 AEWA, the Agreement on the Conservation of African-Eurasian Migratory Waterbirds, is a prime example of an organization that embodies this approach. It is a daughter agreement of the Convention on Migratory Species and specializes in waterbirds that use similar habitats and face similar threats along the African-Eurasian flyway. It was negotiated by countries from different continents, rich and poor, developed and developing, with territories in the frozen north through the temperate zones and the Tropics and across the Equator. The coalition backing the Agreement includes governments and some NGOs with diametrically opposed perspectives – conservationists from BirdLife International and hunters from the International Council for Game and Wildlife Conservation (CIC). It is a constituency united around sustainable use, recognizing that the survival of species is paramount and that for those threatened by extinction, hunting has to be restricted or even banned. AEWA contributes to broader environmental objectives such as the Aichi Targets adopted under the Convention on Biodiversity and to sustainable development. One example is a community initiative in Uganda, which is helping to protect the shoebill from poachers – while the birds benefit from the conservation efforts, the local community benefits from the income generated by ecotourism. AEWA can help through capacity-building, transferring financial resources, expertise and skills available in Europe to facilitate training and conservation work on the ground in Africa. AEWA’s African Initiative aims to improve countries’ self-sufficiency, part of the flyway approach that recognizes that the chances of the species surviving are much greater when they and the habitats upon which they depend are protected the whole length of their migration routes. These can stretch from the Arctic through Europe, across the Mediterranean and the Sahara to southern Africa. Benefiting from the cooperation between Denmark, Germany and the Netherlands, the Wadden Sea is inscribed in UNESCO’s World Heritage List. But all the efforts to develop the area’s ecotourism and maintain the habitat of the 10 million and more waterbirds using it as a staging post on their annual migrations will be in vain, if other key sites along the flyway such as the Bijagos Archipelago are lost. With migratory species, the disappearance or degradation of just one site or inadequate protection or law enforcement in one Range State can have devastating results if the integrity of the chain is comprised and the birds cannot complete their journeys. But birds are also threatened by problems that affect the whole planet – climate change and overfishing for instance. Some birds can adapt – warmer northern winters mean that some birds leave for Africa later and return sooner – but disruptions to the natural order lead to new competition between species and whether one species will win out at the expense of another or some new equilibrium will be established is unknown. Climate change is likely to be the main driver for biodiversity loss and AEWA wants to see mitigation measures in place. Renewable energy is a potential solution as it should reduce the amount of both fossil fuel being burnt and greenhouse gases emitted. But renewable energy is not without risks – an example being birds colliding with the rotor blades of wind turbines, and whether energy is generated by wind, solar, nuclear, coal, gas or oil is irrelevant if birds are being electrocuted on badly designed, poorly insulated and inappropriately located powerlines. Simple and often inexpensive modifications to power infrastructure and enacting and enforcing environmental impact assessments that take account of the needs of wildlife can contribute to reducing if not eliminating the death toll of migratory birds and other animals. Next month, the eyes of the world’s media will be on Paris as thousands gather to reach a deal on measures to combat climate change. But right now hundreds of ornithologists and decision-makers from Eurasia and Africa are attending the 6th session of the Meeting of the Parties (MOP6) to AEWA, twenty years after the treaty was concluded. It will be a time for reflection to assess the achievements of the last two decades, and Parties the length and breadth of the flyway will identify their priorities for regional cooperation to conserve migratory waterbirds. It is also the first biodiversity forum to meet since the adoption of the Sustainable Development Goals and will determine how AEWA will contribute to achieving them and the Aichi Targets. Synergizing at its best – conservation and sustainable development hand in hand.